So I’ve seen a few really great movies in the past couple weeks, but the first film I’ve felt compelled to write about is “Annabelle.” Maybe it’s because bad memories tend to make a bigger impression than good ones. Don’t get me wrong, there were a lot of positives to the movie, but overall I was not very impressed. When it comes to horror flicks, I’m a bit of a baby. I love them to death, but I am not very difficult to scare. That being said, “Annabelle” was riddled with many of what I call “jump scenes,” but lacked any kind of real fear. Think of the difference between “When a Stranger Calls” (jump scenes) and “Insidious” (real fear that will stay with you long after the credits roll). 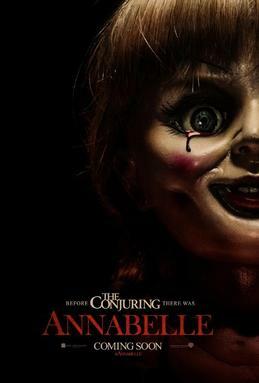 Given that this film is associated with “The Conjuring,” I expected a little more in that department, since “The Conjuring” was the first movie that ever made me close my eyes and swear that I would never watch a horror movie again. Before I jump into what I believe is the biggest negative aspect of “Annabelle,” I will note one very huge positive: the husband. Most horror films exhibit the same pattern of women being home along with the kids and seeing terrifying things and the husband just basically blowing them off completely and telling them there’s nothing to worry about. The husband in “Annabelle,” however, definitely changes that stereotype. From the moment bad things start happening to Mia, John is nothing but supportive and continues to be supportive throughout the entire film. There is only one moment in which John suggests that perhaps Mia is just exhibiting symptoms of postpartum depression or stress, but given the circumstances, it was a very reasonable assumption and was not an offensive suggestion. Another positive aspect of the film that goes along with John’s unwavering support of his wife is that, until the very end, neither Mia or John ever did anything that made me want to yell/throw my popcorn at the screen. Both characters were relatively wise in their decisions and in how they chose to handle the incredibly difficult situations they were put in. Now that I’ve said something nice, I will get to the part that has inspired me to write about this film. The following is all written from the perspective of a Christian who is deeply in love with Jesus and respects her faith and her God. If you have no interest in religion, you probably won’t care much about my opinions here. That being said, let’s discuss the problems. Problem number one, it is clear from the beginning of the film that Mia and John are Catholic and care about their faith. However, there is literally only one moment in the entire film in which Mia finally says “God, please,” which might have just been a common phrase rather than a literal cry to God for help. I don’t see how a Catholic family who is being attacked by demons – a very obviously spiritual battle – wouldn’t be crying out to their God in that time of need. Problem number two, even the Priest who came to their house to “help them” never once prayed with them or offered any kind of spiritual consoling. He did offer (mini spoiler alert) to bring the doll that was believed to be possessed to the church, theorizing that perhaps a “sacred” place would weaken the demonic power. But even then, driving to the church with the doll, not a word was uttered to the Lord. No prayers, no pleas for help, no rebuking statements of God’s power. I would hope that wouldn’t be how my Pastor would handle that situation. And finally, problem number three, which deserves its own paragraph and, by the way, contains major spoilers. In the middle of the film, Mia meets a woman named Evelyn who lost her daughter in a car accident. Evelyn says that at one point in her life, while attempting suicide, she heard her daughter’s voice tell her that God wasn’t finished with her and that He had bigger plans for her future. Great message, right? Absolutely. God definitely has plans for all of us and nobody is ever hopeless with the Lord. He can and will redeem any situation and wipe any tears. But the message is all downhill from there. (Here it is, people: spoilers. If you want to see this movie, I would suggest you stop reading now, as I am about to describe the ending in great detail.) At the very end of the movie, we basically discover that the demons attacking Mia, John, and their baby, Leah, are after one thing and one thing only: a human soul. More specifically, Mia’s. They are constantly threatening and attacking her baby, Leah, leading Mia to believe that they want her baby’s soul. Once Mia realizes that they could be satisfied with her soul instead (which was really their plan all along, given that a soul needs to be offered, and a baby isn’t capable of offering her soul), she does what any good mother would at least consider and decides to give the demons what they want so they will leave Leah and John alone. Evelyn and John enter the room just as Mia is about to leap from her apartment window. At the last second, John snatches her RIGHT out of the air (friend points if you can tell me what that’s from). As John is consoling Mia and reminding her that he and Leah need her to stay alive, Evelyn steps into the window and says that she will take Mia’s place, to end this battle for them, because, and I quote, “This is what my daughter was talking about.” So essentially she is saying that God’s bigger plan and purpose for her life, that her daughter was referring to, was to eventually kill herself and sell her soul to the Devil. Absolutely and positively absurd. Given that this was so completely incorrect and offensive to anyone who believes in God, and given that this was basically the highlight (or climax) of the entire film, with everything leading up to this one big moment, I definitely wouldn’t give this movie my seal of approval. Overall, the main issues I had with Annabelle were surrounded by religion. So if you’re not a religious person, maybe you will enjoy it. Honestly, even without the religious stuff, I would probably only give this movie three stars. It absolutely had some redeeming qualities, and it was not insufferable to watch. I enjoyed my experience, but it isn’t something I would see again, even given the fact that I didn’t have to pay for it. So, in conclusion, three stars if you don’t care about the religious issues, two if you do.